How many times have you heard, “Just stop eating so much and you’ll lose weight”? Easier said than done. If it was that simple, you would’ve done it already! Comments like this don’t create a solution. They make you feel sad and depressed causing you to…eat more. The last thing an overweight person needs is to be informed they’re overweight. “You should…” or “You need to…” will only make you angry. You aren’t clueless. You know you need to eat right. You know you should exercise. Doing it consistently is another thing. If only they told you something you didn’t know. 1) 80% of weight loss is diet. It’s about what, why and how you eat. This is why you see people working their butts off in the gym — even with a trainer (!) – without looking any different. You can’t out exercise a poor diet. It’s what you do between exercise sessions that matters most. This is why we’ve been able to help so many people lose weight without exercising. Some people choose to ignore this because they believe exercise is the key to weight loss. 2) If the only thing you’re changing is the food you’re eating, you’re not going to change for the long term. Most people go on what I call a “food diet.” One month they’re only eating X. The next month they’re only eating Y. 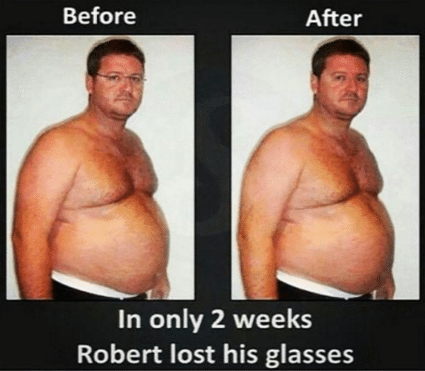 The following month they’re only eating Z. We all know people like this. They go from one “food diet” to the next. Sound familiar? Of course it does. We’ve all done it. We pick a diet and follow the rules for as long as we can using willpower. However, if the only thing you’re changing is the food you’re eating, you’re not going to change for the long term. Otherwise, you’ll keep going from one diet to the next. You’ll never be able to stick with anything. 3) You don’t need more motivation. You don’t need more willpower. In fact, relying on motivation and willpower is a terrible strategy. Most of us follow a certain plan by willing ourselves to stay strong for as long as possible…until we can’t take it anymore. We eventually lose steam, and revert back to our old ways. Like motivation, willpower is not sustainable. Think about how crowded gyms are the first few weeks of January. They’re a nightmare! Those same gyms start to clear out by early February. Why? Everyone WAS motivated at the beginning of January. This is why relying on motivation isn’t a good strategy. It fades. This is why people gain the weight back. They never learn the right mindset along with the habits and behaviors necessary to keep it off. They just “buckle down” and “try hard” using willpower for a few months until they can’t take it anymore. This is not a sustainable strategy, and it’s why most diets get more difficult to follow as time goes on. 4) It’s very hard to reach any goal without accountability. It’s too easy to make promises to yourself and break them. No one knows if you keep them or not…so you hardly ever do. We all know this feeling. The feeling of having been lied to. By ourselves. It’s an awful feeling. Unless you’re being held accountable and being supported daily, it’s hard to stick with it. It’s too easy to rationalize to ourselves. It’s also difficult to sustain the effort required to lose weight. This is where daily accountability and support comes into play. It’s also what makes us different from the billion and one other programs out there. Not only do we tell you exactly what to do in order to reach your goal, but your very own Body Tutor will make sure you actually do it day in and day out. It’s very hard to accomplish any goal without accountability so that’s why it’s the cornerstone of MBT. No one offers accountability like us, and it’s how we ensure you reach your goal. Because we work so closely with you we know when you’re off track. Whether it’s a mental block (for example: fear of failure, fear of success — this is a lot more common than you might think) or a tactical challenge (how to navigate an upcoming party, travel, etc.,), your Body Tutor will be guiding and supporting you on a daily basis. This makes all the difference, and it’s why we get the results we do, guaranteed. What does accountability really mean? It’s hard to explain the power of accountability unless you’ve experienced it. It’s your first day of school. The bell rings, and in walks your new physics professor. He’s carrying a giant red physics textbook. He looks straight at the class, and slams the book down on the table with a big thud……. He then walks out of the room. Now let me ask you…who do you think will actually pass a class like this?? This physics professor has set the class up for failure. ….corrects you when you are wrong. ….supports/guides you every step of the way. THEN what do you think the success rate will be? Very high obviously. The big difference between everyone failing and everyone passing is the amount of support/guidance they got. This is a big reason why people on traditional programs don’t lose weight. Okay, so how do we set ourselves up for long term weight loss success? We’ve figured this out at MBT: We follow the same principles of supporting and guiding our clients every step of the way. This is why 100% of our clients (literally) succeed at losing weight with MyBodyTutor. Learn more about the program by clicking here. In 2007, I quit my job to start MyBodyTutor. Since then I've helped thousands of people lose weight and keep it off with my proven program and methods. Read more. First time here? Read this. Join our free mini-course and discover how and why our clients are able to lose weight and keep it off. 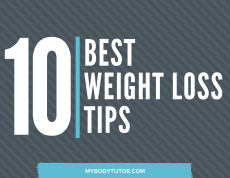 You'll also receive "The 10 Best Weight Loss Tips" I've gathered from over a decade of coaching. • If I can’t be perfekt why bother? • How Janice lost 52 pounds with daily accountability. • How to stop quitting your diet. • Tell me something I don’t know. • Former Miss TN reclaims her sense of control. • How to stop eating at night. • How to finally commit to losing weight. • I have no motivation to lose weight.